When your upstairs floods from an overflowing toilet or bathtub and suddenly water is flowing out the door and down the stairs call Boardwalk Contractors. Depending on when you are able to stop the flow of water, you could end up with a messy cleanup. Unfortunately, this type of water damage is not uncommon, and water leaks or flooding originating from upper level floors have the potential to cause double the damage to your home. Flooding from the second story of a home can occur if you have an upstairs bathroom or laundry room. Water can overflow from a toilet, sink or bathtub, a pipe leading to these fixtures can develop a slow leak or burst, or your washing machine could leak. There are a lot of potential water damage culprits in multi-story homes. While some sources of water damage are obvious, such as the overflowing toilet, others can quietly and slowly build from small leak to major disaster. If you have a pipe with a slow leak you might not notice until damage is visible from downstairs. For more urgent flooding, you’ll want to turn off the water as soon as possible to prevent additional water damage. In the event of a slow leak from a pipe running upstairs, it’s likely that you won’t notice until you start to see signs of water damage. You might notice discoloration on the ceiling and walls below the leak. Remember that water will flow wherever gravity takes it, so the location of the discoloration may not necessarily be where the water is actually coming from, rather it’s the lowest point in the ceiling. Water from a leaky pipe upstairs can pool in your ceiling, causing sagging and potentially collapsing. If your ceiling is sagging, you could have an extensive leak on your hands and it’s best to avoid the area until you are able to determine the extent of the damage. An overflowing toilet, sink or bathtub located in an upstairs bathroom has the potential to send an awful lot of water throughout your home. The first thing you should do is shut off your water either at the source or by using the emergency valve to stop the flow of water. Do not turn the water back on until the problem has been fixed. Call the water restoration experts at Boardwalk Contractors to handle you home flood emergency. Boardwalk technicians will ensure the water is thoroughly dried out, damage is minimized and your home restored. If water entered your walls, you probably have wet insulation and an increased risk of mold growth. The last thing you want it to compound a water problem with a mold problem. Boardwalk restoration pros will make sure that doesn’t happen. The drywall will need to be removed and the insulation replaced. Unfortunately, flooding from the second story level tends to send water downward and can have an effect on your home’s electrical system. Water may run through walls and affect wall outlets or it may escape through light fixtures. Regardless, wet electrical wiring creates a hazard and it’s best to shut off the power until you are able to ensure all the electrical components are dry and safe. Never touch any wiring or other electrical components that have gotten wet without first shutting off the power. Whenever water is present and there’s a live current, the risk of electrocution is possible. If the wet wiring trips your circuit breaker, do not turn it back on until everything is all clear. Proper home maintenance is your first defense against leaky pipes and overflowing toilets. Check for potential leaks regularly and make note of any discoloration or soft spots in the floor or walls. 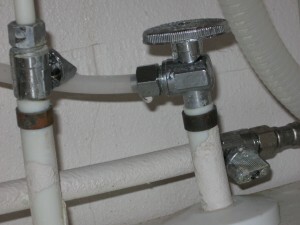 Make sure all visible pipe fittings are sealed and that caulking around your bathtub or shower are sealed. Know where and how to shut off the water in the event of an overflowing toilet or sink, and make sure everyone in the home also knows where the shut off valve is located and how to use it. Flooding is not something anyone wants to experience, and flooding from an upper level of your home causes more damage and increases the risk of electrical shock. Always make sure it’s safe to enter your home before beginning any cleanup, and enlist the help of a Boardwalk professional if you have extensive water damage, or the water has damaged your walls or ceiling. Boardwalk Contractors are available 24/7 to help with your home flooding emergencies.